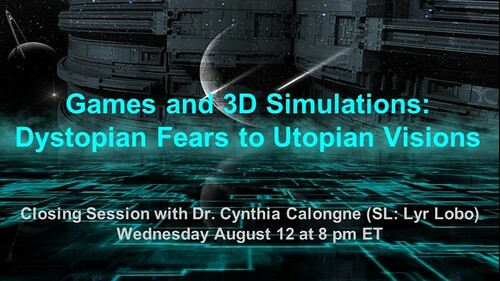 Dr. Cynthia Calongne, Colorado Technical University professor, game designer and researcher will be presenting Games and 3D Simulations: Dystopian Fears to Utopian Visions. Livestream and padlet here. In the book club, we’ve discussed virtual reality, gamification and the quantified self, games as assessment and what school would look like if it was in virtual world. We’ve played Ingress guided in hangouts by Michael Flood and also Cynthia Clark, the Fauxasis created by Matthew Winner (real name) for the Level Up Book Club and even a group of dystopian games curated by Jon Spike.